Smashing the fourth wall and bringing down the house, Counter Culture Club returns to 2022nq. #cccMcr is a late-night micro-festival: a one-night-only underground arts party at the Northern Quarter’s finest creative space. 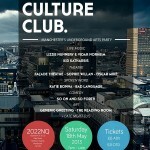 Check out the full line-up and book your tickets at www.countercultureclub.co.uk.